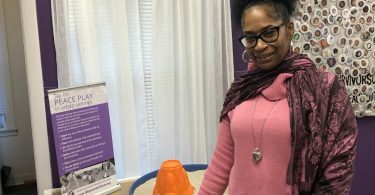 BOSTON – Bending down, picking up, bending down, picking up… Trash thrown in the incorrect bins adds to the workload of Amy Moy and other cleaning staff. Sometimes, they wish they could take over students’ waste and throw it out for them. The appearance of shadow boxes above five trash bins, which began on Nov. 7 of last year, might change the situation. 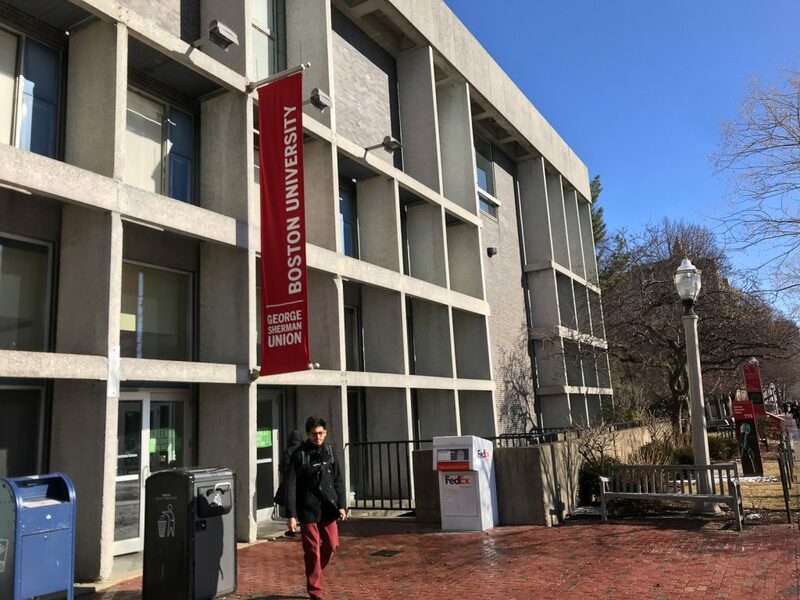 “I’ve heard a lot of people talking about it, so I know that students now are more aware that there was a change and maybe they’re paying more attention now,” said Amy Elvidge, the director of sustainability for Dining Services at BU. Students now are able to contrast what is in their hands with exact objects in the shadow boxes when throwing trash. Before that, the guidance was the signage picture with multiple items on it, which confused a lot of students. 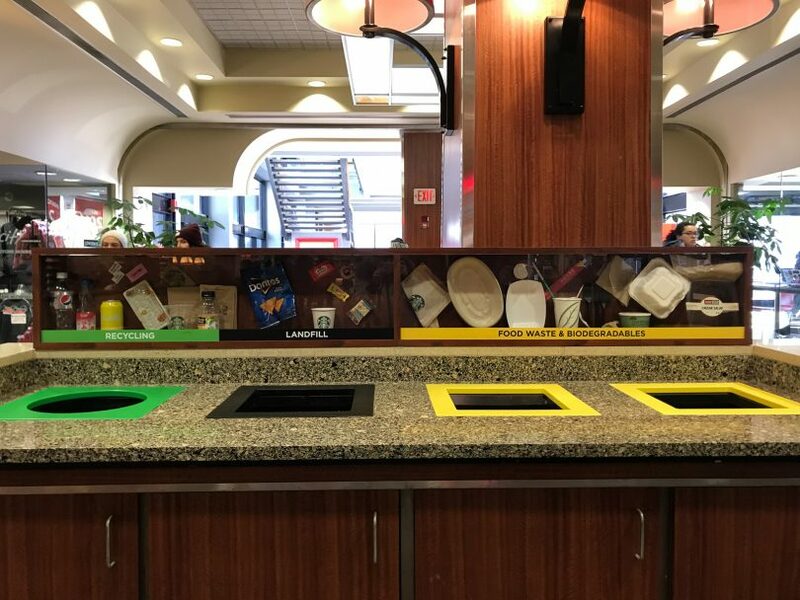 Elvidge hoped this form of visual display could make collected recyclable waste as clean as possible, and the waste sorting process simpler and more accessible for students. According to Elvidge’s introduction, the waste consists of three separate streams, and is sent to different plants. Food waste and biodegradable waste, like paper bags, are transferred into a kind of organic fertilizer. Waste destined for landfills is combusted, and energy generates during the process. Recyclable waste, like plastic bottles and beverages, is sent to another industry. That idea of installing shadow boxes came from Elvidge and the staff at the dining service marketing team, after they noticed this kind of shadow box on other campuses like the University of Massachusetts. The shadow box is also convenient for staff to make changes, Elvidge added. Now, the staff just needs to pull the item out into the new position when the recycling company changes rules of which kind of waste is recyclable. Andrey Poe, a BU graduate student, was glad to see the shadow box and that she finally knew where to throw a sushi box, which was recyclable and different from other types of plastics. Katsiaryna Tsvirko and Heran Haile said they had talked about the shadow box on the first day it was placed. Some students looked at the shadow box carefully and checked what holes they should throw into. They stood in front of the shadow box as if they were reading an article. 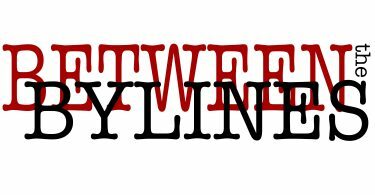 Some even discussed with friends. There were also students who did not follow the guidance. Two of them said they hardly came to this cafeteria and were not familiar with it as the explanation. Bertila Reyes, a cleaning staff member, said she liked the shadow box after having seen students’ improvements. She thought the reason students did not care before was that they lacked related knowledge. Elvidge and her team were going to do another audit to see accurately if the situation was getting better. They only have the statistics from before the change, which shows the weight of the contamination in three streams of waste. If the shadow boxes work well, they will be promoted to the whole campus. 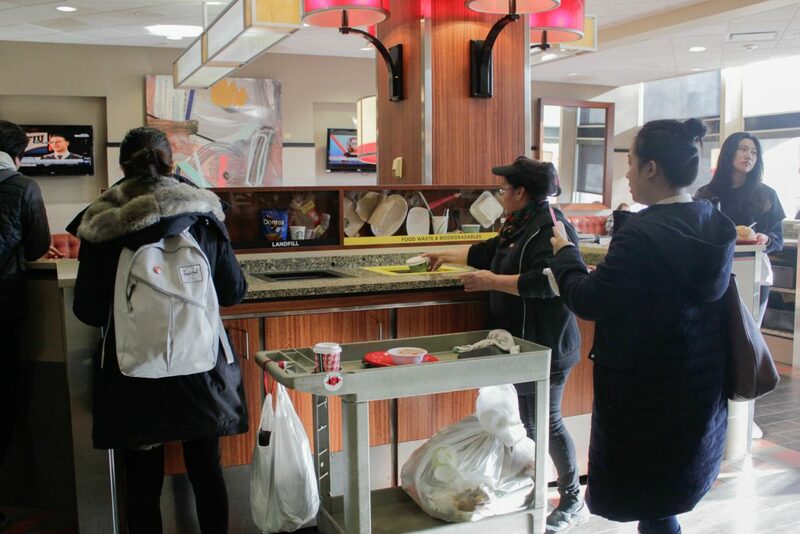 “Everyone is responsible for removing contamination from recycling—students, dining staff, and Save that Stuff (a recycling and waste services industry),” Elvidge wrote in an email.